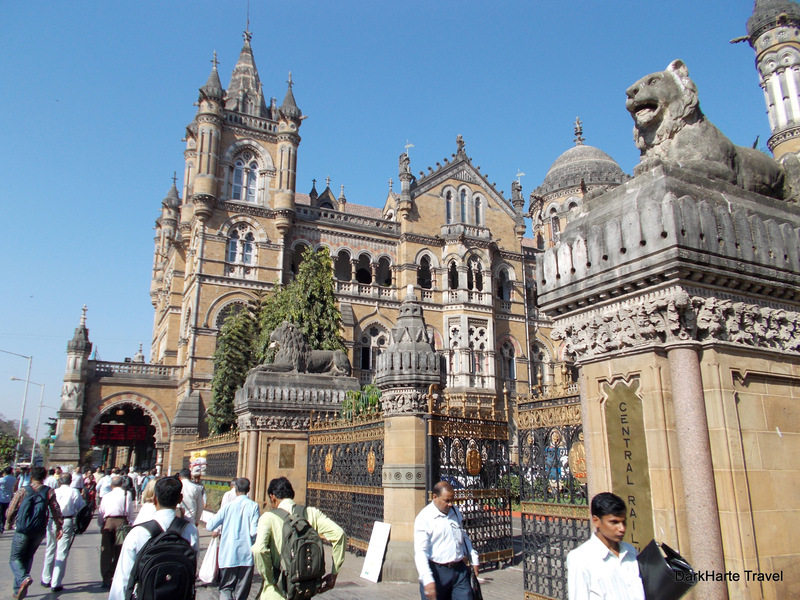 Chhatrapatri Shivaji Terminus (CST) or Victoria Terminus (VT) is the largest railway station in Mumbai. From here one of the world’s greatest railway networks originates, and terminates. 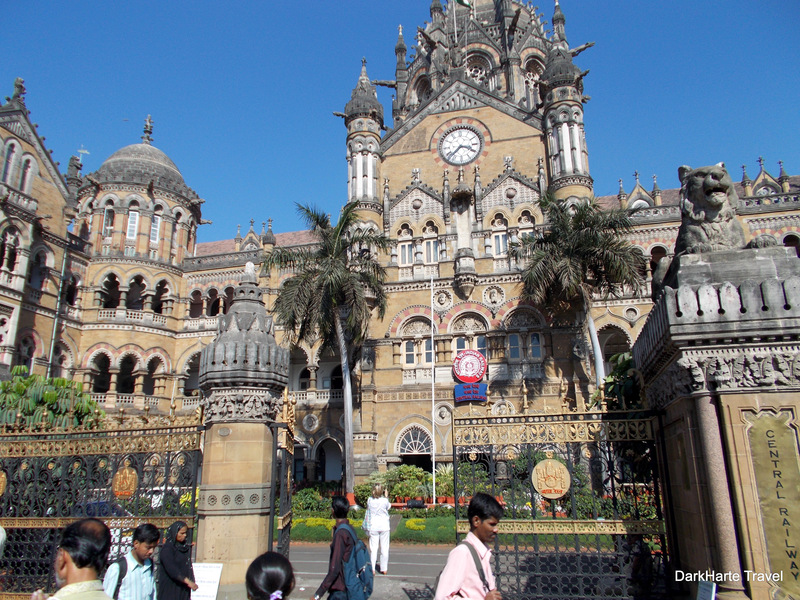 Next to the station lie the Central Railway Headquarters, and behind that, Mumbai’s GPO (General Post Office). Opened in 1887 and named after Queen Victoria, the station is a vital transport hub for both national and suburban rail networks. 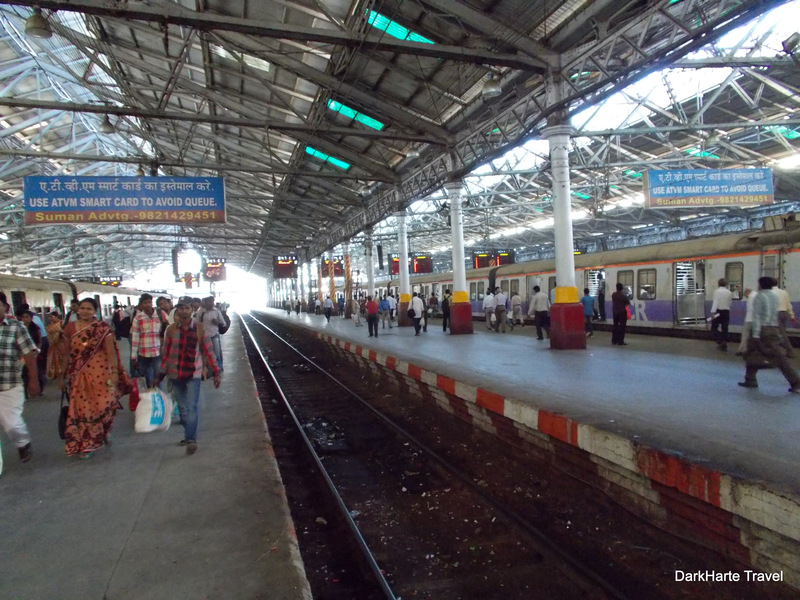 Renamed in 1996, the station is now known interchangeably as either Chhatrapatri Shivaji or Victoria Terminus, and is colloquially often called VT. 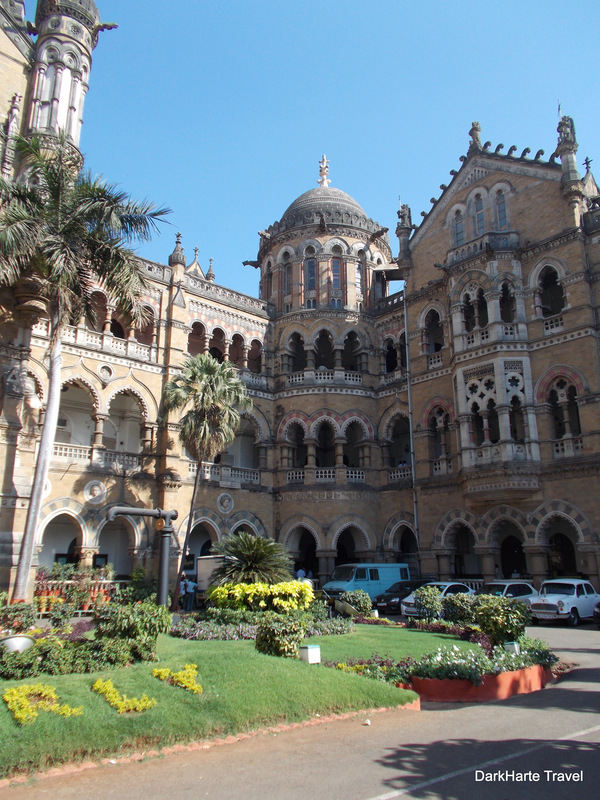 The exterior architecture of CST. 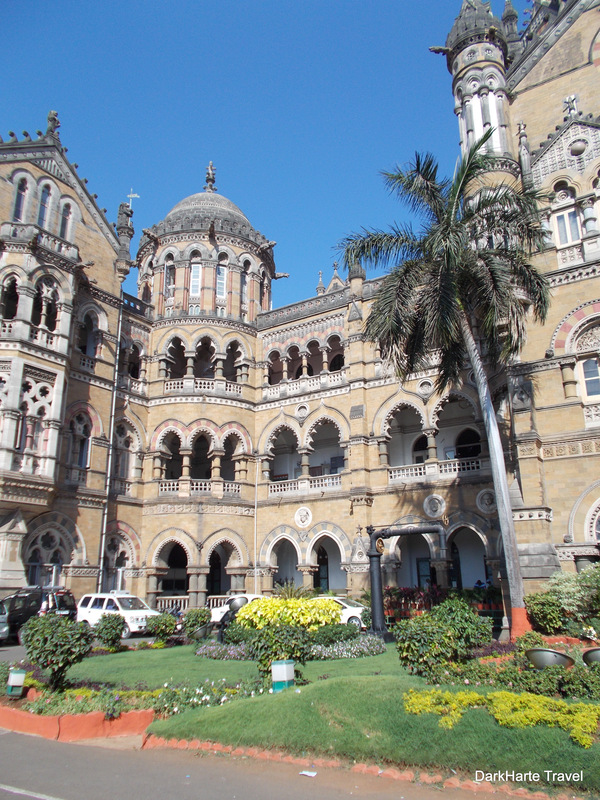 Above: the architecture of the Victoria Terminus building, with palm trees. 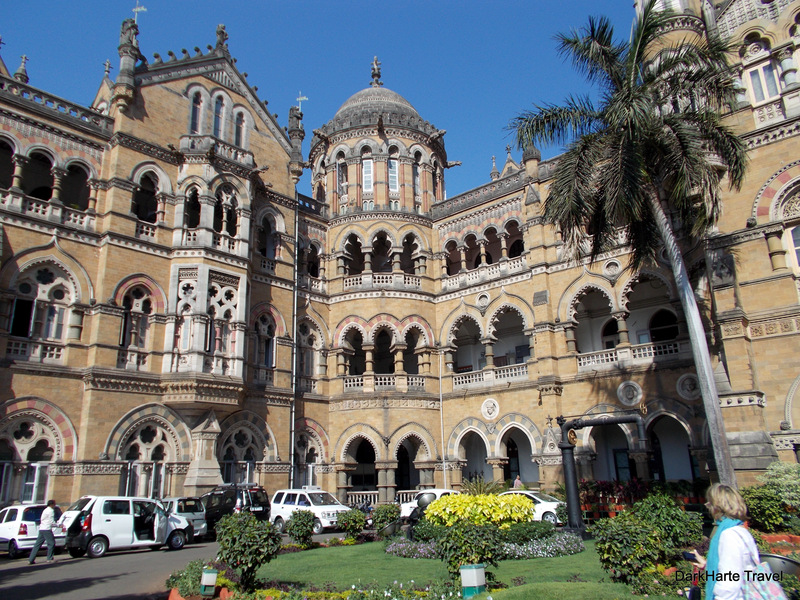 The Railway HQ, though beautiful, is closed to the public. While the woman in the photo above was arguing with the security guards, I slipped through the gates unnoticed, and could stand just inside the pathway and get a couple of photos. I don’t think the security guards mind this anyway, they’re just trying to prevent people wandering freely into the HQ itself. 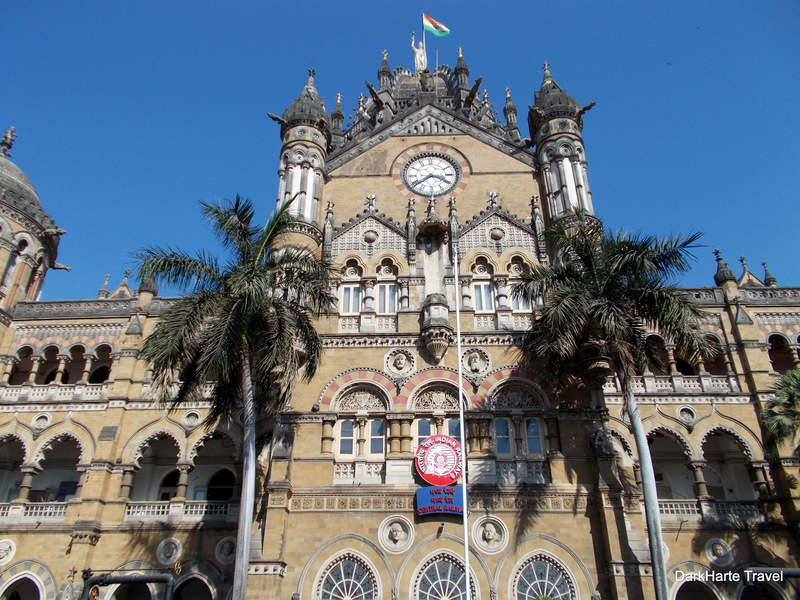 The photo above shows the lions that lie on top of the columns, and the busy street outside the front entrance of the Central Railway Headquarters. Above: the entrance to the Central Railway Headquarters. 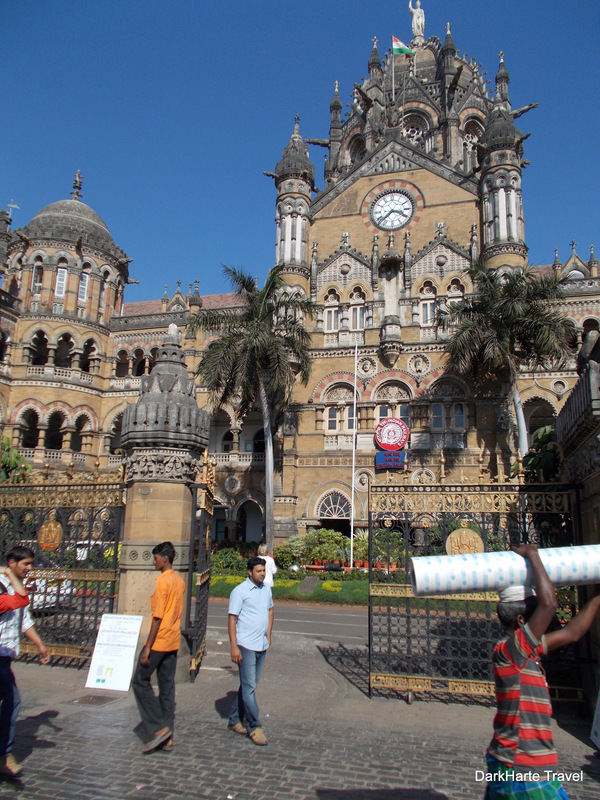 In the foreground Mumbaikers are busy going about their daily business. A bus and taxis on the road outside VT. 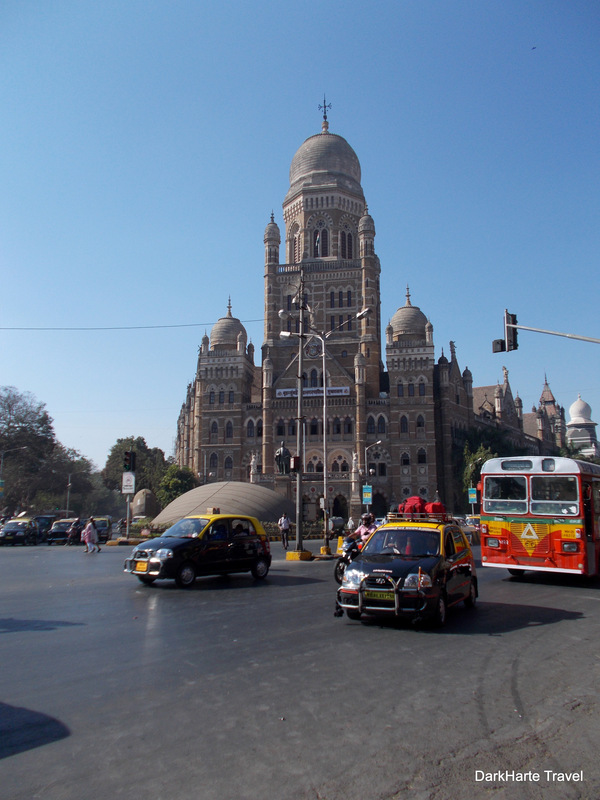 The road is several lanes wide, and opposite the station stands Brihan Mumbai Mahanagarpalika, the City Government Office. 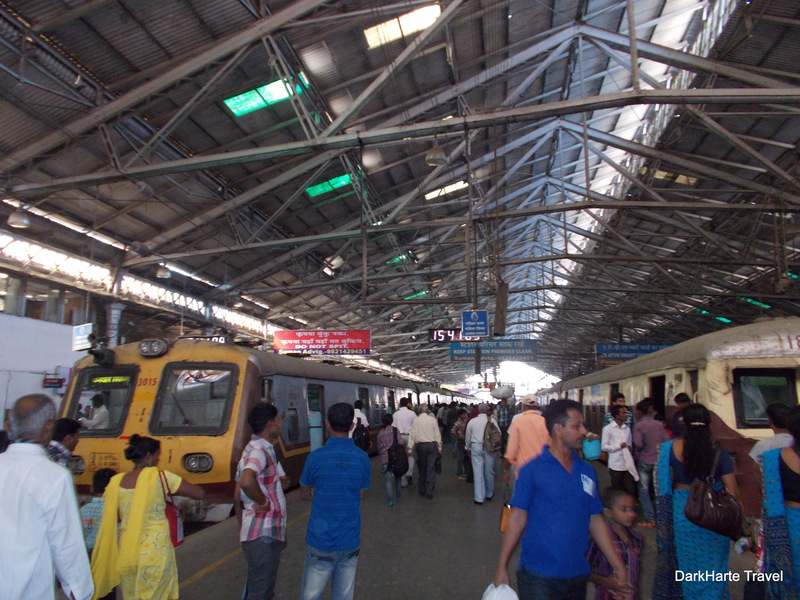 The interior of CST – ticket hall and departure boards. 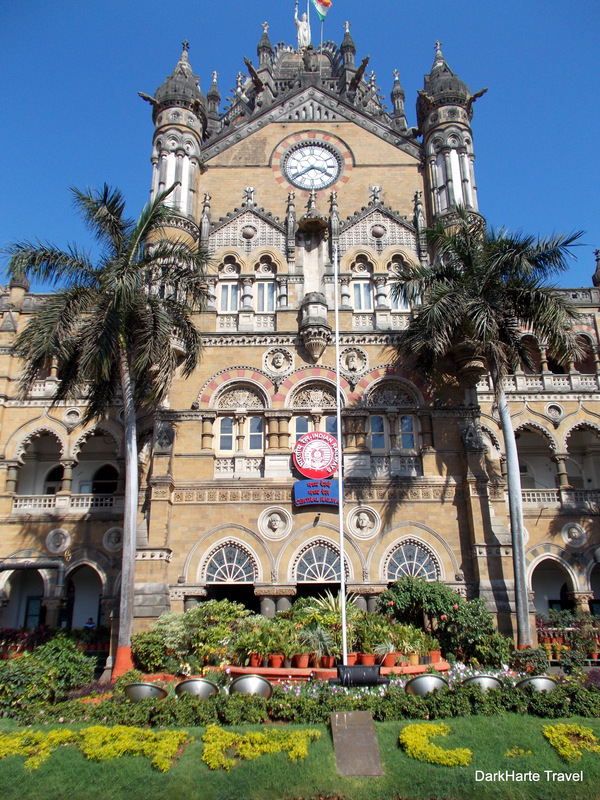 You may recognise this view from the film Slumdog Millionaire – if you look carefully this clock and platform feature in the film, and are the setting for the dance sequence at the very end of the movie. 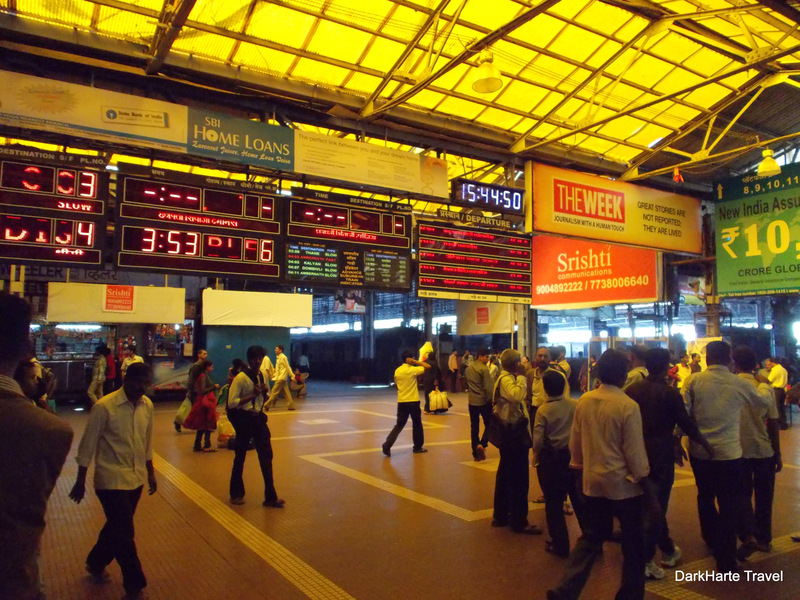 In Slumdog Millionaire you can tell from the clock time in the shot that the dance sequence was filmed in the middle of the night – which is the only time the station would be empty enough for a troupe of dancers to take over the platform. 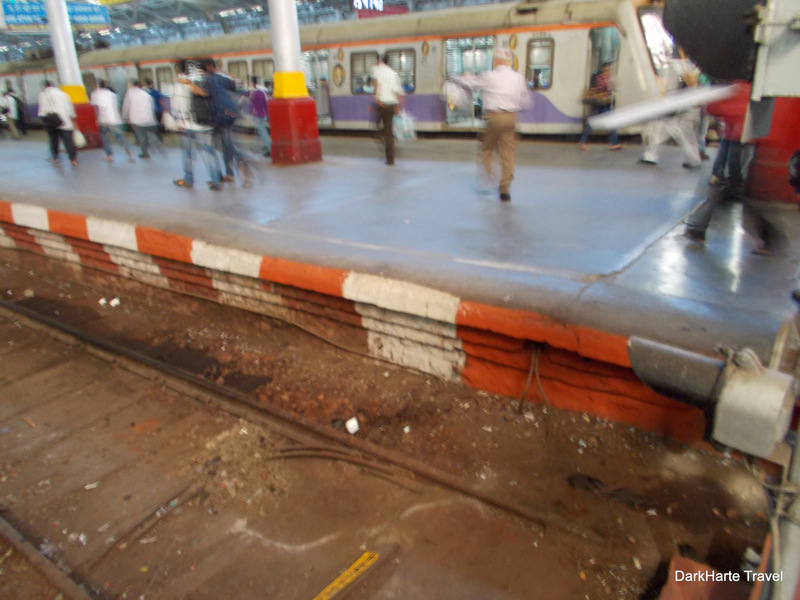 Rats were openly scampering around in the tracks within the station, undeterred by daylight and the presence of people. This is a Ladies-only carriage on the Central line, a suburban rail line in Mumbai. You can tell it is Ladies-only not by the advert strip above the windows, but by the portrait of a woman in an oval marker beside the carriage door. 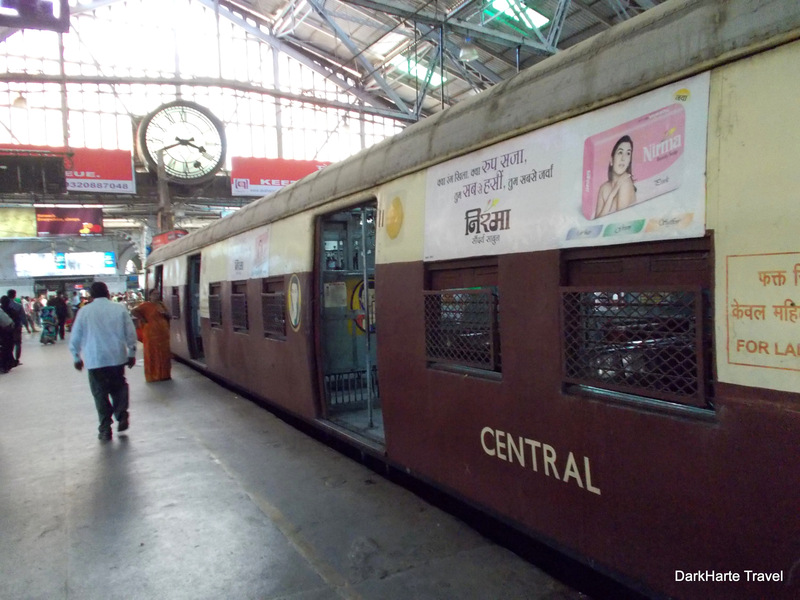 Carriages on the suburban trains include Ladies-only and General carriages; the General carriages consist of First and Second class, and anyone can travel in these – both men and women. Only women can travel in the ladies’ carriages. This setup is not for gender segregation, but a way to keep women safe from any harassment while they are travelling on the trains. 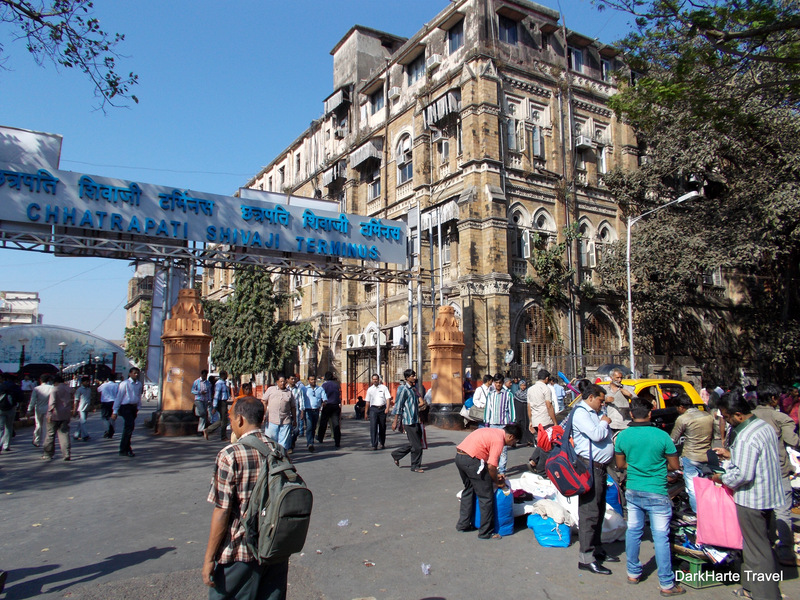 Exiting CST through the ticket hall, your route leads past impromptu market stalls in the road, and heads towards the General Post Office.